Email at any time. Call at reasonable hours, we are home based. Home Phone: 580-265-4685 . I have map quest the Stonewall School for my Address is: Donneta Williams , Rt. 1 Box 186B , Stonewall, OK. 74871 and map quest does not show route locations. But we are close. Call me,and I can tell you exactly how to find me. I do airship, buyer pays "all" shipping expence; usually totals to $ 400 anywhere in contential USA. Depends on weight of pup + aircrate and which airport, Delta or Contential. I can airship if you pay all shipping expences. I ship from OKC Will Rogers World Airport with Safe Pet. Penny long coat, age 8 mo. 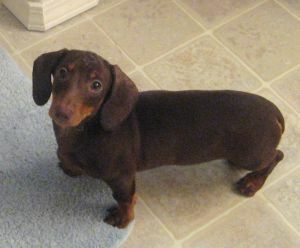 youngster here is Champion of the Weenier Races. She won the first place trophy. This map will take you to Stonewall School. I will have to give you directions to my home but I do not mind meeting at Stonewall School. Depending on weather. 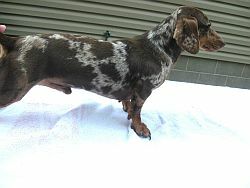 He is a lovely AKC chocolate dapple. He is Houdini son. He is my only male. Chocolate Cocoa is retiring. 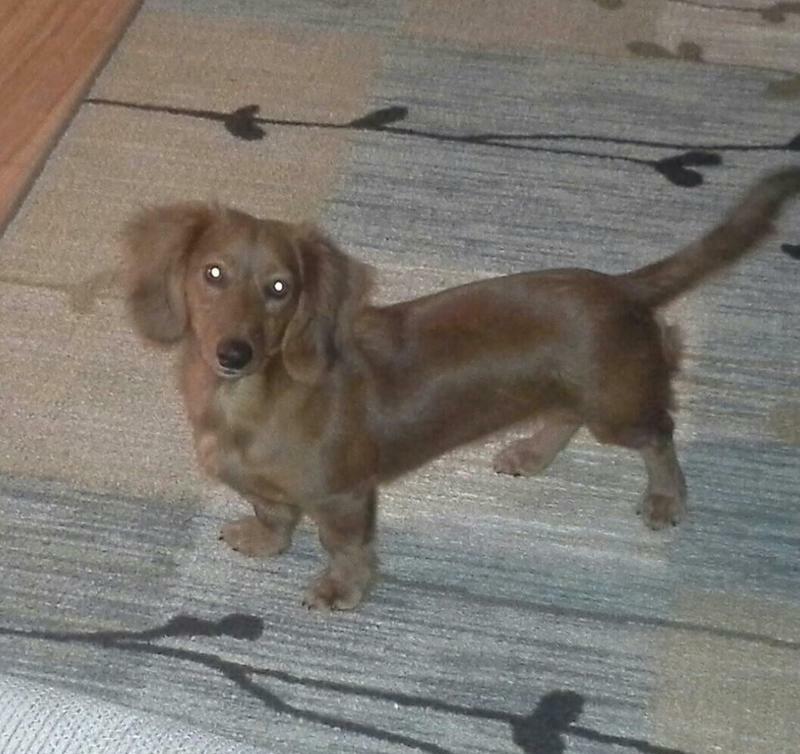 LOOKING FOR A SOLID COAT FEMALE WHICH WILL BE 11 POUNDS AND UNDER. AKC, COLOR DOES NOT MATTER. My tiny Tawnee is retired. Now just a sweet pet for us now. 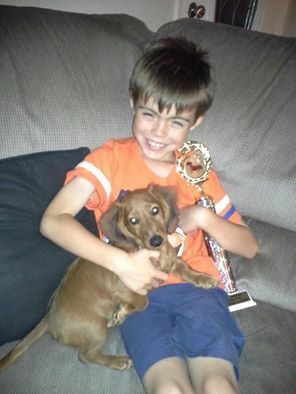 The winner of Weenier Race shown to left. 12 # at 1 year old. Deposits are accepted and unrefundable unless the pup becomes ill and refund will be given. 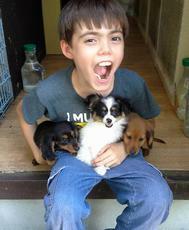 Pups that have a deposit will be expected for you to pick them up at 8 weeks age. If you have me to keep it longer, a charge of $2. a day plus extra health care i.e. vaccination is $25. Registrations. All my pups can be registered if you want registration papers. AKC or APRI. I offer my pups as pets not for breeders or show. You will be given AKC limited on pets. Or APRI pet .~~~ If you want full registration, the cost of a pup will be more. 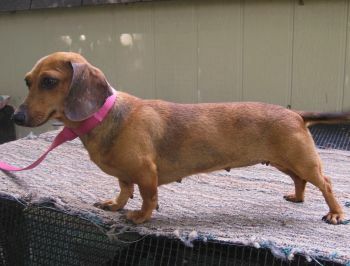 .Some of my pups are show/breeder quality. Health Guarantee My pups are given wormings and first vaccination and you are expected to take pup to your vet 2 to 3 days after getting it to have it checked over and set schedule of future vaccinations..My health guarantee on genetics up to one year age. Not responsible for neglecton your part. Must be taken to your vet within 3 days for guarantee to be valid. If within the year period a live threatening genetic problem happens; bring pup and all papers to me and I will let you choose another pup of same value. If more value, you would pay more. 580-436-7881 # YOU MAY CALL ME FOR INSTANT PICTURES OF PUP YOU ARE INTERESTED IN. I am easy to talk with. They call me Red Sandy. I am female born March 1, 2019. I am CKC registered. Healthy. Have had my first shots and wormings. My brothers sold. I need a good home. Mom is 11 pound, Dad is 9. . Call Donneta at 580-436-7881 and she can send more pictures if you are interested. Here is another pose of me below. Asking $800. but call, Donneta is easy to talk with.